When you tell people you’re about to spend two weeks in Medellin, Colombia, their first reaction is to tell you that you’re going to get murdered. But when you explain that Pablo Escobar has been dead since 1993 and Colombia has rebounded from the drug cartel days to become a vibrant story of redemption and rebuilding, they tell you that you’ll probably also get kidnapped. Old reputations die hard. I’ve been wanting to visit Colombia since I went jogging in Barcelona a few years ago with a Colombian expatriate. He extolled the virtues of his home country as we ran along the Mediterranean, or at least I imagine he did because my Spanish is a little shaky. It’s also possible that he was from Columbus and I should be visiting Ohio this month. Anyway, about two weeks ago the travel bug bit me hard, so I cashed in some last-minute frequent flier miles and planned a trip for Medellin. I have an American Airlines credit card which nets me a free South American vacation every year. I get one mile for every dollar I spend on everyday purchases and two miles for every dollar I spend on American Airlines. If they ever come up with a credit card that gives miles based on purchasing cat food, I’ll be able to afford a flight to Jupiter. Over the years I’ve gotten pretty laissez-faire about planning my international trips. In the early days, I used to try to plan out every detail and make sure I packed just the right things. For this trip, I threw some items into a carry-on backpack and headed for the airport. There’s nothing I can’t pick up in Medellin that I couldn’t get in Portland, unless I have some kind of crazy vegan salmon jerky emergency. Colombia? Ha ha ha ha ha ha ha ha ha ha ha ha ... uh, no! After talking to a nice customer service agent, the upshot was that they won’t even put in a travel alert for Colombia because of astronomical levels of fraud. “You can try your card, and it may or may not work,” said the helpful lady. I may or may not pay my bill. My flights were long but uneventful. Mileage tickets are rarely the best times or connections, and this was no exception. I left Portland at 9:30 p.m. and immediately had a scheduled layover in the San Francisco airport from midnight to 7 a.m. I walked to my next gate and tried sleeping on the floor, but was awoken every half hour by the loudspeakers blaring a reminder to NOT LEAVE LUGGAGE UNATTENDED FOR THE SAFETY AND SECURITY OF EVERYONE. This would have been useful information if there had actually been anyone or their luggage in the airport at 3 a.m. The only people present were me and the late-night workers operating a suite of noisy machinery such as an industrial-strength vacuum, a motorized floor waxer the size of a Zamboni, and a leaf blower. I’m not 100% sure about the leaf blower; I was wearing a sweater over my eyes and the sound was drowned out by the voice reminding me to NOT LEAVE LUGGAGE UNATTENDED FOR THE SAFETY AND SECURITY OF EVERYONE. I didn’t get a lot of sleep. It was an easy 90-minute layover in Miami, then one final three-hour hop across the Caribbean to Medellin. Before departing, the gentleman in the window seat next to me flagged down a flight attendant to urgently inform her that there was fluid dripping off the wing and it might be a fuel leak. She assured him that she would let the captain know, in the same tone of voice I imagine parents must use when reassuring their children that they will check under the bed for monsters. A few minutes later she returned to let him know that the captain had declared the liquid to be “condensation,” and also in the event of a water landing there was a Cthulhu under his seat. Passing through customs in Medellin was quick and perfunctory, and I didn’t even have to declare the 25 kilos of beef jerky I was carrying in my backpack. I went to an ATM and withdrew $600,000 Colombia pesos — the exchange rate is 2,629 pesos to the dollar. I feel like a gazillionaire here every time I buy a pack of gum. 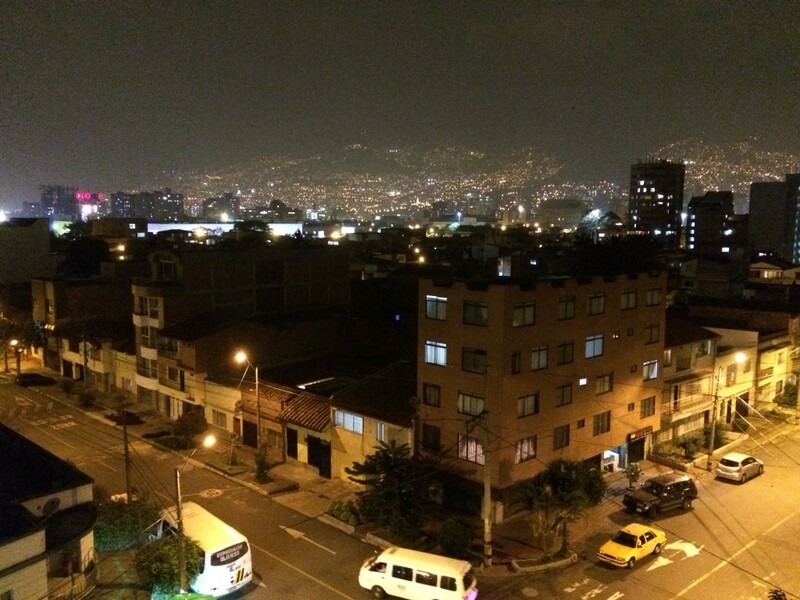 I jumped into the first taxi I saw, gave the driver the address of my AirBnB, and settled back for the one-hour drive into Medellin. Until I decided I was being kidnapped. Here’s the thing: I usually have a pretty good sense of direction, and it sure did not feel to me like we were driving in what I imagined to be the right direction for Medellin. Plus, I was pretty sure I had read that there was a modern four-lane highway from the airport to Medellin, and we were currently on an undivided two lane highway winding slowly up through the mountains. Plus, we had blatantly ignored a number of exits that had signs for Medellin. Plus, it occurred to me that there was nothing on the outside of this white car that actually said the word “Taxi” – I had just jumped into the first car where someone had shouted “Taxi!” Plus, there was no meter. Plus, the driver was being awfully quiet — usually Latin American taxi drivers are up for some idle chit-chat. Plus, the driver kept putting on his turn signal as if he was about to turn off onto a long dirt road leading to a secluded hacienda where I would be held for ransom. I mentally kicked myself for not doing a credit check on my emergency contact. So we were driving along windy mountain roads, and I was making panicky calculations as to whether I could leap from the moving vehicle and use my backpack to cushion the fall as I escaped from my abductor. Luckily, a few minutes later we reached the toll booth for entry to the four-lane highway, and I relaxed because it seemed like a really incompetent kidnapping strategy to bring your victim through a toll booth with security cameras; plus, take it from the cheapskate who scheduled a 7-hour overnight layover at SFO to save a few bucks on airfare, I believe it would be poor financial strategy to plan a kidnapping route that included tolls. The driver delivered me right to the door of my AirBnB condo and charged me the official, government-regulated price of $60,000 (about 35¢ USD, I think). I was met at the door of the AirBnB condo by Gloria, the landlord’s agent, who gave me a tour in Spanish. A few minutes later the landlord arrived and gave me the exact same tour in English, which was a nice test of my listening comprehension. It’s a good thing — based on my Spanish competency I probably would have peed in the microwave. After a good night’s sleep I spent yesterday exploring the neighborhood, grocery shopping, working with my office back in the USA (the internet here is strong and reliable, much like the coffee) and going for a run. I also got to watch a massive thunder and lightning storm. I’ll spend more time exploring the city over the next few days, but so far I like what I see. It’s a beautiful, verdant, energetic city, surrounded by tall mountains which provide gorgeous scenery during the day and a twinkling nightscape after dark. Also, it feels completely safe whether walking around during the day or at night, although I am remembering to NOT LEAVE LUGGAGE UNATTENDED FOR THE SAFETY AND SECURITY OF EVERYONE. I absolutely love your travel blogs. Keep them coming!